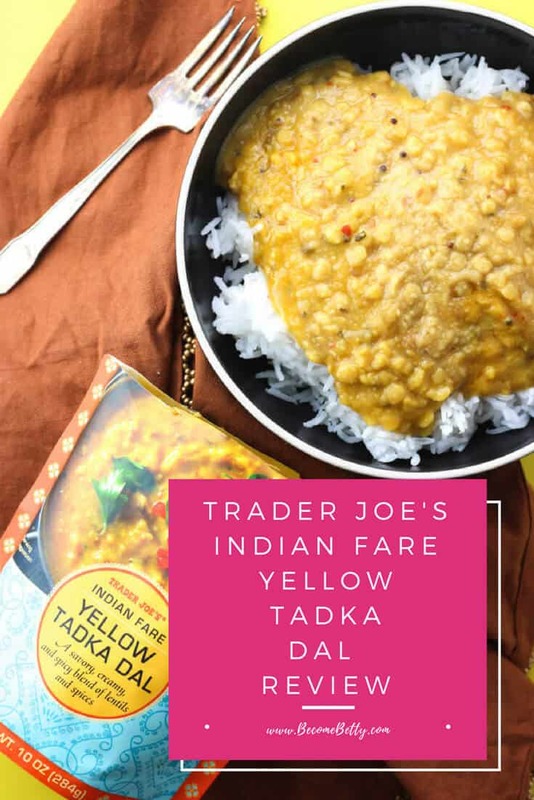 The pros: Trader Joe’s Indian Fare Yellow Tadka Dal is new, well spiced, and different from all the other Indian dishes available at Trader Joe’s. The cons: While I love the tikka options, this one was just ok. 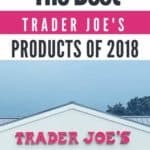 This item is not vegan. 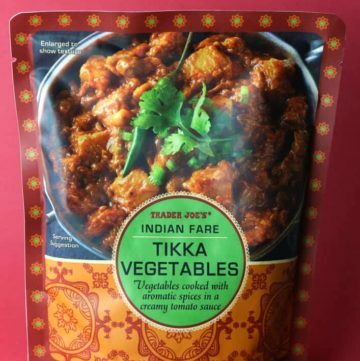 The pros: Trader Joe’s Indian Fare Tikka Vegetables is one of two new pouches of Indian food to hit shelves. While this package looks small, the portion size is just right. The cons: Not quite as good as the frozen entrees, but not bad either. 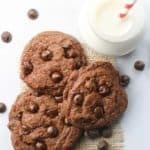 If you were hoping for this to be vegan, sorry to disappoint but it does contain milk. 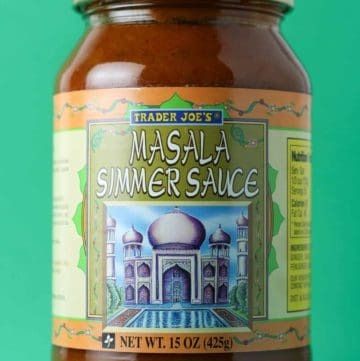 The pros: Trader Joe’s Masala Simmer Sauce is a decent simmer sauce, but if you’ve had anything from the frozen Indian entrees those are far superior in quality. The cons: While there are spices in here, the heat is almost non-existent. So if you are looking for the heat, keep hot chili powder or cayenne close by to mix in. 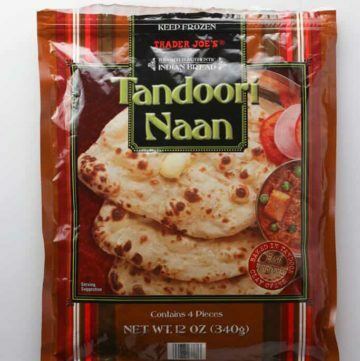 The pros: Trader Joe’s Tandoori Naan is quick and tasty bread straight from the freezer. The cons: It’s plain, but odds are you aren’t eating this by itself. 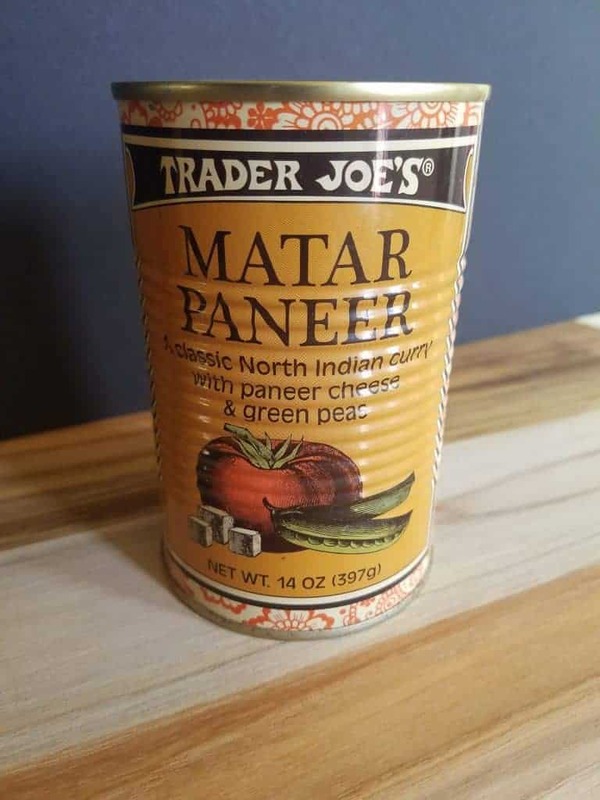 The pros: Trader Joe’s Matar Paneer star ingredients were the peas and paneer were the stars here. The curry sauce was just ok. The cons: Not the best of the Indian selections, but hey what do you expect in a can? Not pretty when you open and dump out the can. 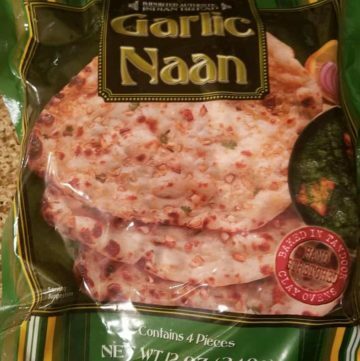 The pros: Trader Joe’s Garlic Naan is a very tasty bread that has just the right amount of garlic and cilantro. 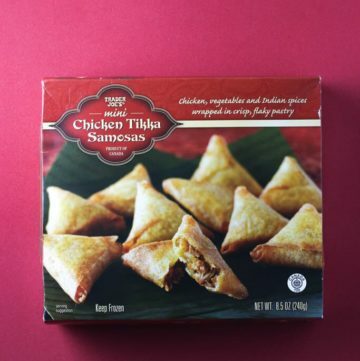 The pros: Trader Joe’s Mini Chicken Tikka Samosas are generously filled with tasty chicken tikka masala filling. 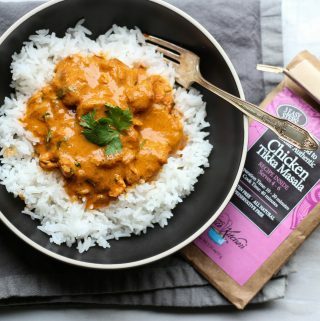 It will remind you of a finely shredded Trader Joe’s Chicken Tikka Masala with mashed potatoes. It is does not contain as much sauce as that would ruin the crispy won ton like pastry wrap. Medium in heat this might catch some off guard who don’t read the package carefully. The cons: This is a medium heat product so be warned. No microwave allowed on this one. 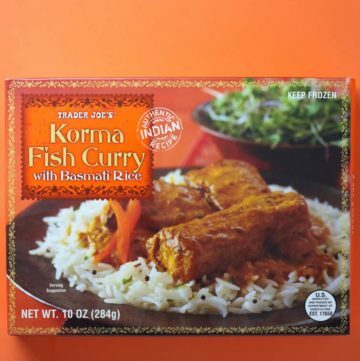 The pros: Trader Joe’s Korma Fish Curry expands the Trader Joe’s line of Indian cuisine. At $3.49 this is reasonably priced and in line with everything else they offer. It’s also an excellent value when you consider you are getting a fish entree (and a good sized portion of fish) for this price. The cons: Must enjoy (or be willing to try) curry to appreciate this dish. The occasional fenugreek leaves left behind in the rice was an element which I wasn’t crazy about. Swai doesn’t taste like much, but the sauce carries this dish. 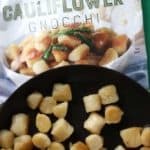 The cons: The dish has a lot of chickpeas which can be very filling. I almost wanted a vegetable to go with this because it had so much sauce to it. 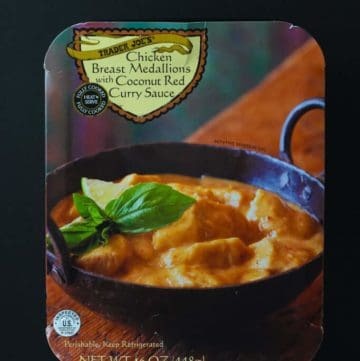 The pros: Trader Joe’s Chicken Breast Medallions with Coconut Red Curry Sauce has a tasty curry sauce, tender chicken, ready in under 4 minutes. The cons: You’ll need a side dish of some sort. It’s just chicken and curry. 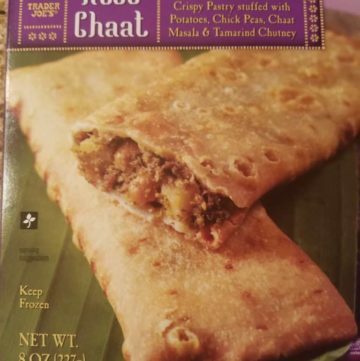 The pros: For $2.29 Trader Joe’s Aloo Chaat Kati Pouches which contain two pouches. Vegetarian snack, hearty filling reminded me of meat. Crispy pasty. Ready in 4 minutes (unless you want to burn your tongue by not waiting for it to cool down). 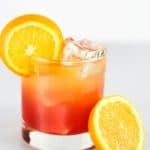 The cons: If you are sensitive to spice, this spice will linger on your tongue for a while. It’s medium heat. Filling will be a hit or miss with some people. 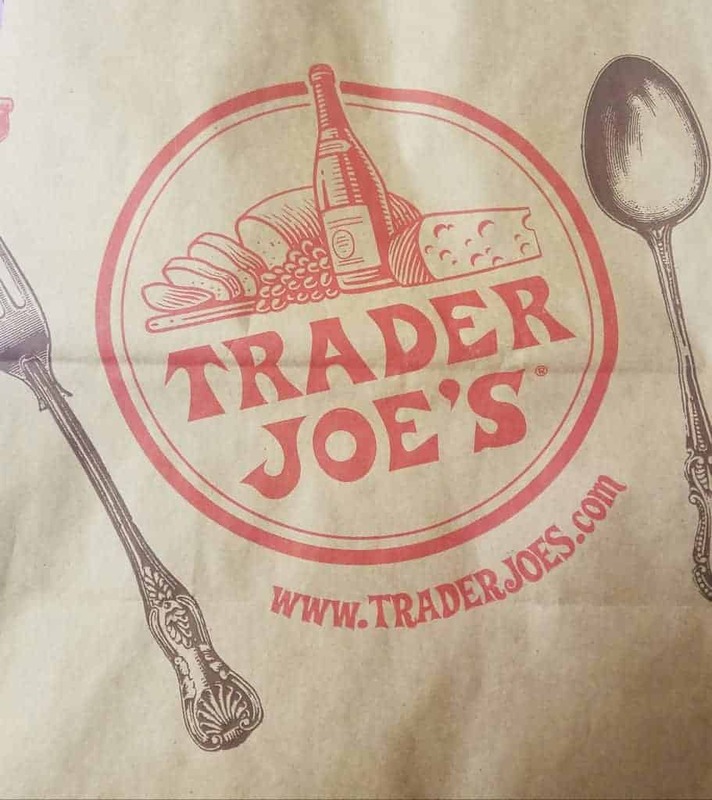 Trader Joe’s has one of the largest selection of Indian cuisine I’ve seen in any mainstream supermarket. So it’s been fun to experiment before I step foot into an Indian restaurant to compare them to the more authentic experience. I just want to avoid sounding like an idiot walking into one. I’d also want an idea of what I’d like too. So it’s been a pretty good adventure so far. 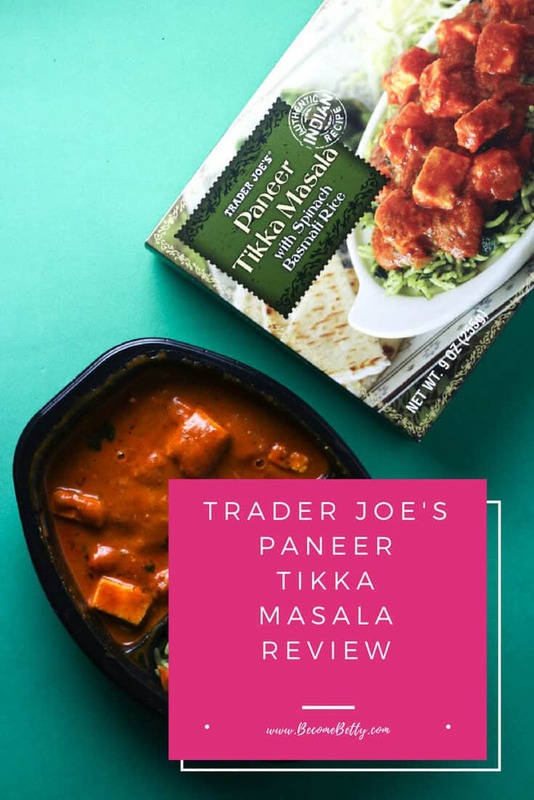 The Trader Joe’s Chicken Tikka Masala and Trader Joe’s Paneer Tikka Masala have been my favorite. 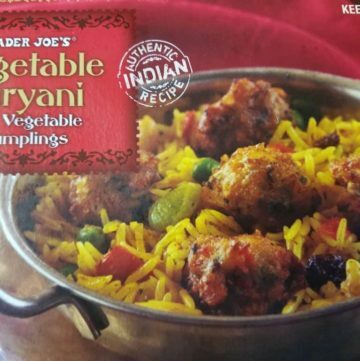 So I figured I’d expand my horizons and give Trader Joe’s Vegetable Biryani a whirl. 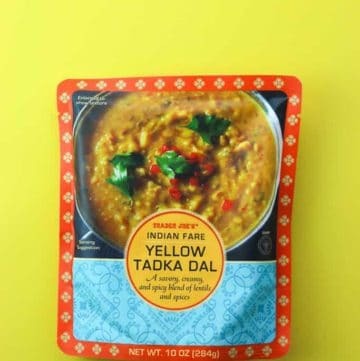 The good: Three or so minutes in your microwave and an Indian lunch/dinner is ready for you to enjoy. Veggie dumplings were quite tasty. Decent calorie count if you are watching those types of things. The bad: rice had a strong curry flavor to it, but I felt like it needed just one more element to complete the dish like a sauce. 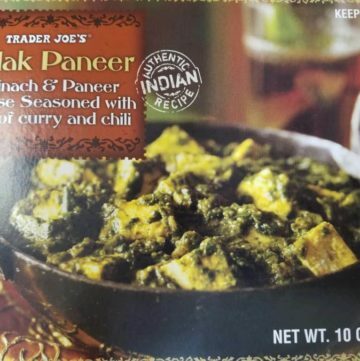 This is one frozen entree that is frequently unavailable is Trader Joe’s Palak Paneer. I wasn’t sure what to think of it just looking at the package. 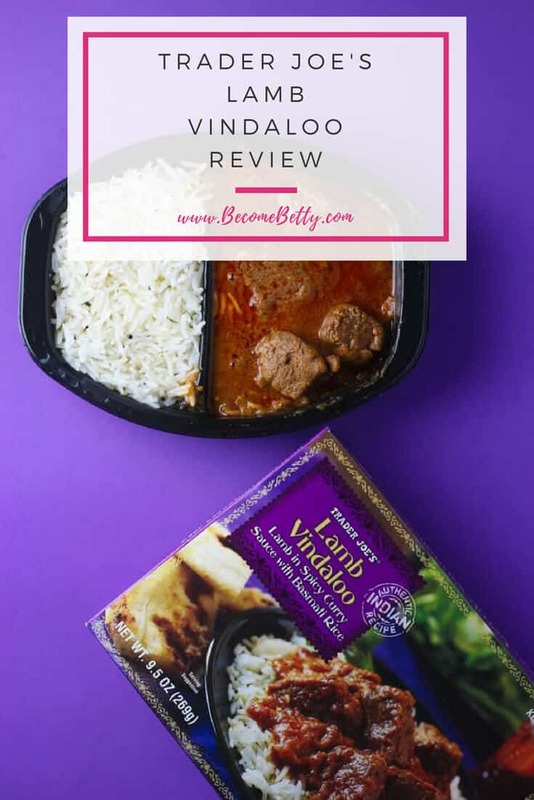 I’ve enjoyed their other Indian dishes such as the Trader Joe’s Vegan Tikka Masala, Trader Joe’s Lamb Vindaloo, Trader Joe’s Butter Chicken, Trader Joe’s Chicken Tikka Masala and my personal favorite the Trader Joe’s Paneer Tikka Masala Review. What I enjoyed most about the Paneer Masala was the Spinach flavored rice and the Paneer itself. This one is called Palak Paneer because Palak means Spinach. Can this dish be supplemented, yes, the back of the box give you recommendations to serve this with rice. Being that this is my lunch I’m having it without, but I’d highly recommend this with rice…. 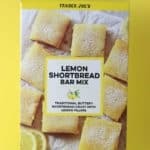 I’m not vegan and for the most part I’m very doubtful when it comes to trying anything labeled as such. I have the image of bunny food and tofu and the knowledge that I will walk away less than satisfied. 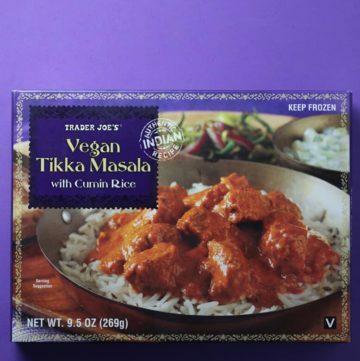 But I was wrong with Trader Joe’s Vegan Tikka Masala. This dish took me by surprise. 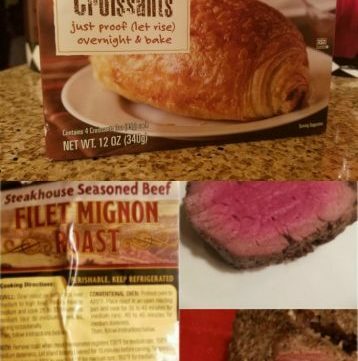 The “meat” fooled me. If you had put this dish in front of me and not told me it was vegan I would have been none the wiser. The meat tasted like a perfectly shaped meatball. I didn’t feel like I was missing anything at all. 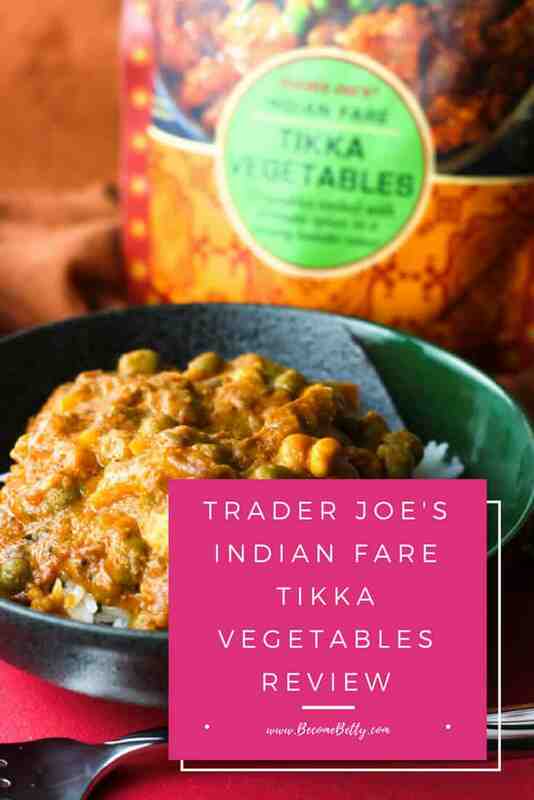 This is a standout in the Indian section as is Trader Joe’s Paneer Tikka Masala and Trader Joe’s Fish Korma Curry…. I’m not always the best about packing my lunch. It’s good to have certain meals available in the freezer at work. 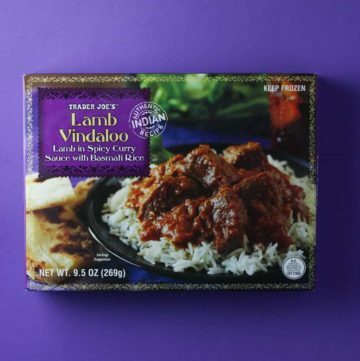 This is another selection from the Indian food in the Trader Joe’s Lamb Vindaloo. My full thoughts follow the pictures below…. 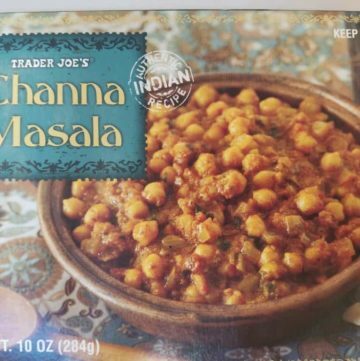 So another box from the Trader Joe’s frozen Indian cuisine. I can honestly say I’ve never had Butter Chicken out. It also goes by another name murgh makhani, but that is no where on the package. 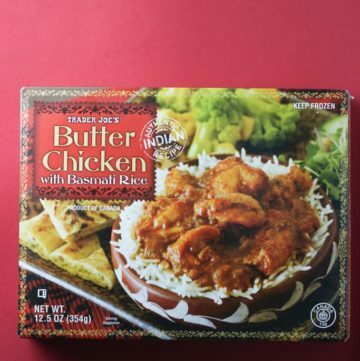 What does Trader Joe’s Butter Chicken consist of? Plain Basmati rice and a spicy chicken curry. How spicy is this batch? As spicy as mild chicken wings in a bar, where there is heat but there is no pain…. 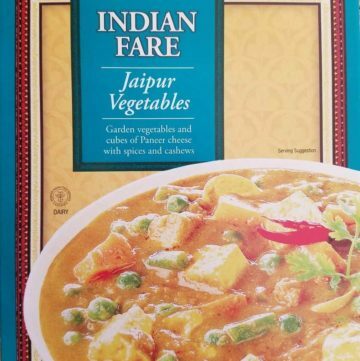 If you are like me, Indian was not a familiar flavor in my household growing up. 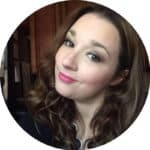 In fact, in an Irish-American household salt and pepper were exotic and frequently only placed on the table at holidays. They were frequently not passed around, nor were they used in my lifetime. That same salt and pepper shaker were my grandparents, which means that that salt and pepper is likely half a century old if no longer. In other words, it probably wouldn’t taste like much. So Indian is definitely a foreign, but now much embraced flavor. 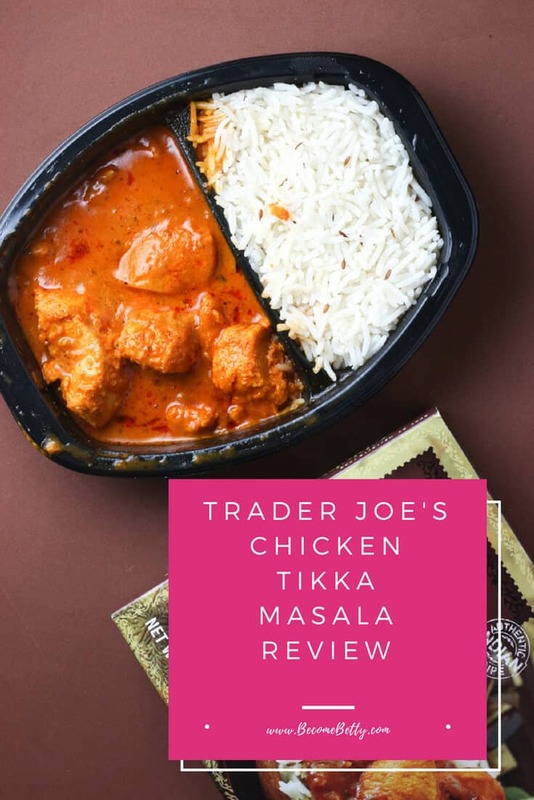 So I ventured outside of my comfort zone and tried Trader Joe’s Chicken Tikka Masala. I’m glad I did…. 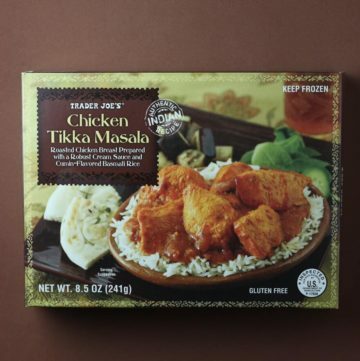 I’ve reviewed Trader Joe’s Chicken Tikka Masala in the freezer section. 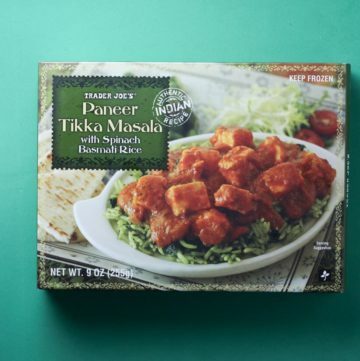 In actuality, Trader Joe’s Paneer Tikka Masala was the first Indian food I tried from their line of Indian cuisine in the freezer section. I looked at the picture, had no clue what Paneer was. I falsely assumed it was chicken somehow I was genuinely fooled. It could very easily pass as the most tender chicken you’ll ever eat (it’s cheese by the way, not chicken). Paneer for anyone who is unfamiliar with it, is like a cottage cheese that is pressed into cubes much like a ricotta salata….